Russia's workhorse rocket failed again after only three successful missions. A Proton rocket with the Briz M upper stage lifted off from the Baikonur Cosmodrome in Kazakhstan on August 18, 2011, at 01:25 Moscow Summer Time carrying the Ekspress-AM4 satellite for Russia's Satellite Communications Organization. 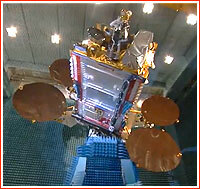 According to the International Launch Services, ILS, which markets the Proton outside Russia, the vehicle performed nominally with the Briz M upper stage and the spacecraft separating at the appropriate time. However, the contact with the Briz M and spacecraft was lost after the fourth burn of the upper stage, ILS said. Roskosmos specialists were then able to locate the upper stage and efforts were underway to establish contact with the Express-AM4 spacecraft. In the wake of the launch failure, a Russian State Commission of inquiry has been established and has begun the process of determining the reasons for the anomaly. ILS promised to release details when data become available. In parallel with the State Commission, ILS said it would form its own Failure Review Oversight Board (FROB). The FROB was to review the commission’s final report and corrective action plan, in accordance with U.S. and Russian government export control regulations. Only on Aug. 23, Roskosmos announced that a malfunction in the flight control system of the Briz-M upper stage led to the delivery of the Ekspress-AM4 satellite into the wrong orbit. The agency press-release said that tracking facilities of Russian space forces and NORAD had been able to find the satellite in the 20,294 by 995-kilometer orbit with an inclination of 51.23 degrees toward the Equator. Representatives of Russian satellite communications organization and EADS Astrium (the satellite's manufacturer) "made joint attempts to establish contact with the satellite," Roskosmos said, however according to the Russian media six days of efforts to communicate with Ekspress-AM4 had been fruitless and the spacecraft would have to be written off as a total loss. This mission was previously expected to take place in the second half of 2010. On Aug. 30, 2011, Roskosmos announced that an interagency commission completed the investigation into the loss of the Ekspress-AM4 satellite. Based on the analysis, it was established that during the formation of the flight program for the Briz-M upper stage, too little time had been allocated for the operation of the gyroscopic stabilization platform. As a result, Briz-M was unable to maintain the correct attitude control, leaving the stage and its payload in the wrong orbit (at the end of the final engine firing). Corrective measures would be implemented before the next Proton launch, Roskosmos said. The press-release also said that in accordance with the directions of the agency head, the administrative investigation had been still ongoing into the degree of responsibility for the accident among officials at Roskosmos, GKNPTs Khrunichev (the Proton manufacturer), MOKB Mars (the developer of the flight control system on Briz-M) and at TsNIIMash (the agency's chief certification center). Roskosmos also announced that it had given go ahead to the upcoming missions of the Proton/Briz-M launch vehicle in 2011, however did not say when the return to flight would take place. On the same day, GKPS organization, which operates Russian communications satellites, declared Ekspress-AM4 a total loss and claimed 7.5 billion rubles ($260 million) in insurance from OSAO Ingosstrakh. The exact fate of the satellite apparently remained a mystery even to its manufacturer, EADS Astrium. In case of the failure like the one which took place, the flight control program onboard Ekspress-AM4 had so-called "safe mode" – essentially a set of instructions which would command the satellite's solar panels to unfurl following the separation from upper stage and thus prevent onboard batteries from depletion. However Astrium still was not able to establish the contact with the spacecraft, leaving ground controllers wondering whether the satellite had frozen in space due to extremely cold temperatures or some other problem caused a complete failure of onboard systems. According to TsNIIMash, the analysis of the satellite's final incorrect orbit showed that three tons of propellant available onboard Ekspress-AM4 would not be enough to bring the spacecraft into the correct position in the geostationary orbit. During August, careful ground observations of the Briz booster stage, which left Ekspress-AM4 in the wrong orbit, indicated that the rocket body had been tumbling in space, likely as a result of propellant or gas escaping from the vehicle's tanks. At the beginning of September 2011, ground observers also detected small deviations in the trajectory of the Ekspress-AM4 satellite, which could not be explained by external forces. Again, propellant or gas leaks were the most likely cause. On Sept. 12, the satellite's manufacturer, Astrium, suddenly announced that Eksress-AM4 was in contact with ground control with its solar panels partially deployed and oriented toward the Sun. According to the company's representative, it took ground control nearly a week to find the spacecraft in its wrong orbit. However, no information had been provided on when the contact with the satellite had been established, or whether it responded to any commands from the ground. The satellite was reportedly in safe mode and its power supply, communication and heating system was functioning. The investigation report released by ILS said that the inertial coordinate system onboard Briz-M upper stage failed between third and forth firing of the space tag's engine. The telemetry from Briz-M became unstable after the beginning of the forth maneuver and the radio signal kept weakening until a total loss of contact 12 minutes after entering the communication range. The analysis of the actual orbit of the DTP external tank, which Briz-M jettisoned as planned after its third engine firing, allowed to make a conclusion that during the third maneuver, the stage pitched from a prescribed orientation in space along the local coordinate system. Based on this information, it was determined that the intermediate gimbal ring responsible for pitch axis in the gyroscopic attitude control system had reached a hard stop, essentially stuck, at the gimbal limit. (The remaining two rings of the gyroscopic system for yaw and roll were allowed to roll all 360 degrees.) At this point in the flight, the inertial reference frame was lost and pitch errors continued to worsen for the remainder of the flight ending in the incorrect orbit. Analysis of the flight program showed that the time allotted for the delta rotation was incorrectly entered in the flight program for the maneuver prior to the third engine firing, ultimately leading to the mission failure. Despite a proposal to use Ekspress-AM4 for communications over the Antarctica, the owners of the satellite ultimatly decided to deorbit the striken bird to avoid even slight possibility of collisions with other spacecraft. By late March 2012, Express-AM4 was still in a long- lived orbit of approximately 660 km by 20,300 km with an inclination of 51 degrees. As the spacecraft neared apogee on the morning of 25 March 25, 2012, ground controllers at EADS Astrium fired the satellite's engines, sending the spacecraft for a destructive reentry into the Earth atmosphere over the Pacific Ocean a few hours later. The reentry maneuver was scheduled between 09:45 and 10:33 UTC followed by debris impact around 13:32 UTC (17:32 Moscow Time) on the same day.